Mattia Preti (1613–1699), Queen Tomyris Receiving the Head of Cyrus, King of Persia (1670-72), oil on canvas, 181 x 129 cm, Private collection. Wikimedia Commons. Cyrus the Great may have been King of Kings, but he has appeared in remarkably few Western paintings. Apart from some showing a rather gruesome legend about his infancy, and Rembrandt’s magnificent depiction of him with Daniel, he has mostly been shown dead and dismembered. These images have been drawn from another legend, this time surrounding the circumstances of his death, which was generally agreed to have been in about 530 BCE near the Syr Darya river (also known as the Jaxartes), roughly where modern south Kazakhstan and Uzbekistan are, between the Aral Sea and Tashkent. Cyrus’s rise to great power had been the result of a succession of bloody military campaigns. In around 553-550 BCE he fought his grandfather’s armies to make himself king of the Median Empire, and swallowed Sogdia after a campaign between 546-539. In around 546, he also conquered the Lydian Empire, then Lycia, Cilicia and Phoenicia by 542, after which it was Elam’s turn by 540, and he then took the Neo-Babylonian Empire in 539. Around 530 BCE, Cyrus the Great was trying to extend his empire to the north-east, in the steppe around the Syr Darya, which was then the territory of the Massagetae; their queen, Tomyris, challenged him in battle. According to the account given by Herodotus, Tomyris’ son and general Spargapises was tricked into defeat by Cyrus and taken prisoner. Spargapises committed suicide in captivity, which caused his mother’s determination for vengeance. Queen Tomyris personally led her forces into battle, and inflicted massive casualties on Cyrus’s army. Cyrus himself was killed, but Tomyris was not content with mere death. She had the body of Cyrus decapitated, and dipped the head into blood, as a symbol of revenge for Cyrus’s lust for blood, and her son’s death in his captivity. Those who live by the sword, die by the sword. Even Herodotus admitted that there were other versions of events, and the histories left by Ctesias, Xenophon, and Berossus differ again. However, it is the revenge of Queen Tomyris which has most inspired Western artists. Peter Paul Rubens (1577–1640), The Legend of Tomyris (The Head of Cyrus Brought to Queen Tomyris) (c 1622-23), oil on canvas, 205.1 × 361 cm, Museum of Fine Arts Boston, Boston, MA. Courtesy of The Museum of Fine Arts, Boston, http://www.mfa.org, via Wikimedia Commons. 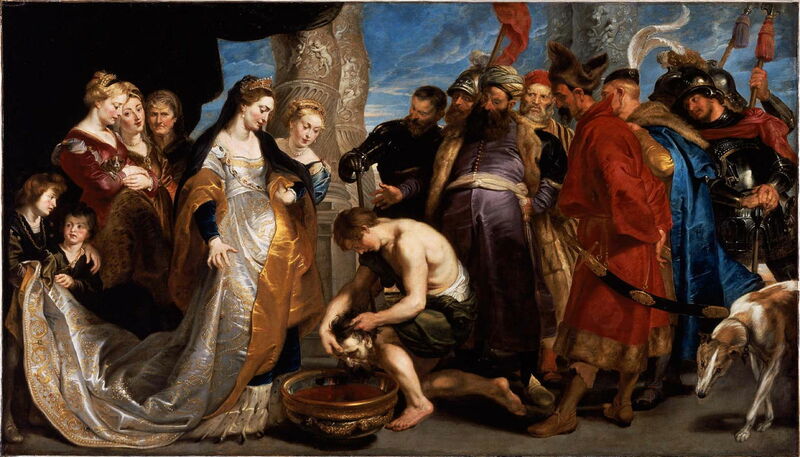 Peter Paul Rubens’ The Legend of Tomyris or The Head of Cyrus Brought to Queen Tomyris from about 1622-23 is by far the best known of the paintings of the fate of Cyrus the Great. Queen Tomyris, at the left with her court, is watching as Cyrus’ head is lowered into a bowl of blood. Behind her, at the far left, are two pages, who were modelled from Rubens’ own sons, although much of the painting was probably made by his studio assistants. It is thought that this unusual painting was the result of a commission by Isabella Clara Eugenia (1566-1633), the Infanta of Spain and ruler of the Southern Netherlands at the time. Apparently she had already linked herself with the legend of Queen Tomyris, and pageants in her honour had strengthened this association. By 1662, Rubens’ painting had come into the possession of another powerful woman, Christina, Queen of Sweden (1626-1689), who was another colourful character, and in 1941 it finally made its way into the Museum of Fine Arts in Boston, MA. Rubens and his patron the Infanta of Spain must have seen Tomyris as an epitome of the triumph of virtue over the evil of Cyrus, the success of a strong and brave woman over a barbarous man. Mattia Preti’s Queen Tomyris Receiving the Head of Cyrus, King of Persia (1670-72) shows the queen herself immersing Cyrus’ head in the bowl of blood, in a closely-cropped view. Luciano Salvador Gómez (fl c 1670), The Vengeance of Tomyris (c 1670), oil on canvas, 178 x 267 cm, La Nau, Universitat de València, Valencia, Spain. Wikimedia Commons. This painting is one of very few works known of Luciano Salvador Gómez, for whom we do not have dates of birth of death. 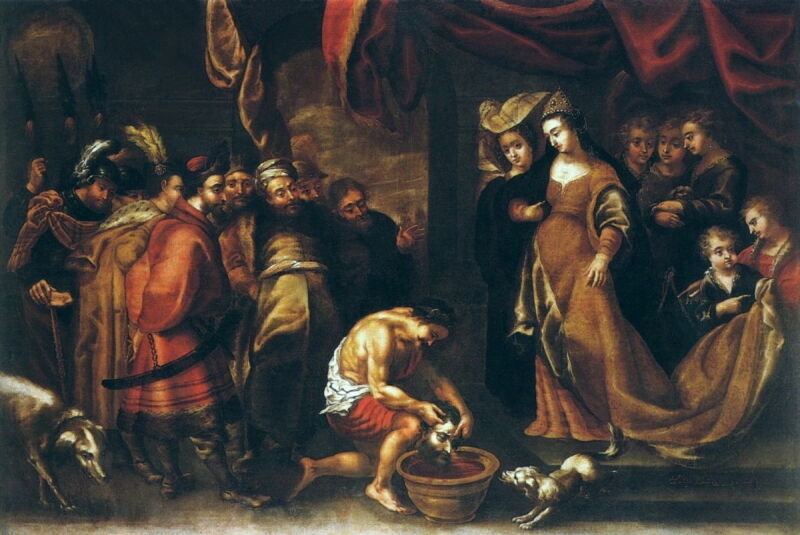 His The Vengeance of Tomyris was probably painted sometime around 1670, and is a derivative of Rubens’ painting with the image reversed left to right. Giovanni Antonio Pellegrini (1675–1741), Queen Tomyris (1719-20), oil on canvas, 123 × 97 cm, São Paulo Museum of Art, São Paulo, Brazil. Wikimedia Commons. Giovanni Antonio Pellegrini may have painted two different versions of Queen Tomyris. This, from 1719-20, shows her, bare-chested, pointing down with her left hand. In front of her, a page holds a warrior’s helmet. In the background a maidservant appears to be assisting with her dress, and behind her is a man dressed for battle in his helmet. 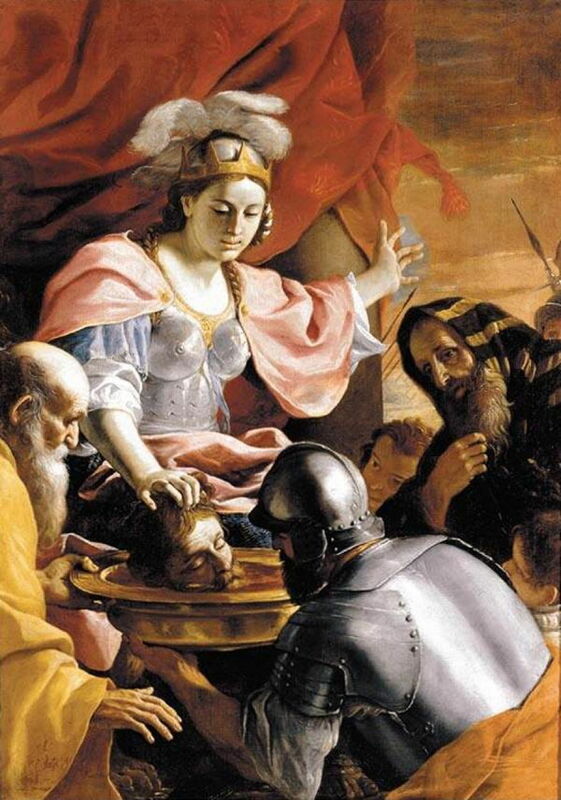 The other (for which I have been unable to locate any image) shows Tomyris overseeing the immersion in blood of the head of Cyrus, in a manner similar to the earlier paintings above. I think it most likely that this version is either part of a larger painting showing Tomyris being undressed after her success in battle and the death of Cyrus, pointing down at his severed head to direct its immersion, or a more close-cropped allusion to the bigger picture. Was Cyrus as evil as this story makes out, and was Tomyris really a virtuous queen? With only the legends handed down to us, it is impossible to make such a judgement today. However, Cyrus’s empire proved more stable and successful than even that of Alexander the Great, and in the fullness of the history of the region, he looks to have earned his epithet of Cyrus the Great. Posted in General, Painting and tagged myth, narrative, painting, Pellegrini, Preti, Rubens, Salvador. Bookmark the permalink.